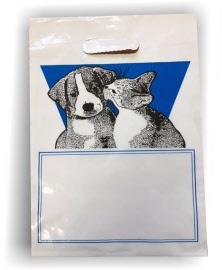 This white plastic bag is imprinted with a puppy / kitten in black and blue ink. It measures 9" x 12" with a grab style die-cut handle. Ideal for the puppy and kitten care kits or for dispensing.